Released: Out now in most territories. Review: Please be aware, I absolutely love dragons so, yeah DRAGONS. 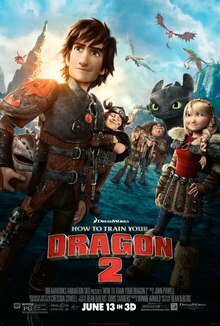 This film is set five years after the first film and Hiccup’s Dad is preparing him to take over as chieftain of the clan. However Hiccup is travelling out, looking for another Night Fury for Toothless. What he discovers will change their world forever. So, lets start with the story line. It is well packed and easy to understand, even if you have not been able to see the first movie. (Where have you been?!) There is a touch of romance, family relationships and a tear-jerker, never mind all the epic dragon action. The plot it written beautifully and manages to keep the audience interested. More dragons are introduced and their is friendship and forgiveness is still a major factor in this series. They even manage to integrate jokes about Hiccup losing his leg as well as showing the bonds between the riders and dragons. The Voice actors were superb and managed to add a depth and realistically express the emotions of the characters they were voicing, whether happy or sad. For me, their acting never seemed forced and unreal which can totally wreck a scene, it was very open and realistic. The animators have done a brilliant job in both fore and back grounds with different things happening, whether it is Toothless playing around while Hiccup is being serious or the elder dragon moving and having lots of dragons in the fore. They keep all the animations constant and even add in stubble to all the boys, wait, young men in the film. This must have taken serious man hours to complete and the overall image and consistency is amazing. The animation is very clear and although a cartoon they have made the world they live in seem very real and easily imaginable that we too could be there, somewhere. As the scenes changed, the animation also changed the hues and tones to match the mood, whether it was bright and airy for happy times or dark and gloomy for the much sadder times the animation itself has added a tone to the movie and even without the dialogue, a viewer can tell when it is happy or sad by watching. I just have too say, Toothless was absolutely epic in this movie, words cannot describe how happy and amazed I was at the development in Toothless’ character and the obvious love and devotion between him and Hiccup even during the darkest of scenes. Understandably I was overjoyed to hear that there will be a third film.